It was my wonderful Dad who taught me the joy of double-dipping a gooey grilled cheese sandwich into a big bowl of creamy tomato soup. Yum! And regardless of whether you pair it with grilled cheese or croutons, this classic soup makes a delicious hearty lunch, or a super easy, yet satisfying dinner! In a large stockpot over medium heat, add the olive oil and chopped onion. Sauté until soft and translucent (about 4-5 minutes). Then, add the garlic and sauté just until fragrant. Stir in the tomato paste, until onions are well coated. Then, add the tomato purée, chicken stock, dried herbs, honey, salt and pepper. Stir well to combine. Bring soup to a gentle boil, then reduce heat to a gentle simmer. Cover and allow soup to gently simmer for 20 minutes. Using an immersion blender (or blender or food processor), puree the soup until smooth. Return soup to the stockpot and set over low heat. Whisk in the coconut milk and re-season to taste with additional sea salt and pepper. Remove stockpot from heat and ladle into serving bowls. P.S. This soup is even better the next day after the flavors have further melded, so be sure to save any leftovers! In a small bowl, combine equal parts of melted butter and olive oil. Lightly brush both sides of your favorite sliced GF bread with the butter-olive oil mixture. Then, lightly sprinkle both sides with sea salt, garlic powder and dried parsley (or Italian Herb seasoning). Next, cube the bread and place on a baking sheet. Bake at 300 degrees for 20-35 minutes, until the croutons are lightly brown and hard. Allow to cool completely. Store croutons in an airtight container in freezer for up to one month. When I saw this picture in my inbox this morning I knew I had to change plans and make this for dinner tonight. I am so glad I did! We’re not big tomato soup lovers, but everyone (6 of us) in the house thought this recipe was good. I’ve never commented before, but I do want to thank you for all you share. It has been such a blessing to my family! This looks delicious. We’ve been looking for a creamy homemade tomato soup recipe. My son is lactose intolerant. Could this be made with whole lactose free milk instead of the cream? Coconut milk (from the can) works well! Finally made this soup. It is DELICIOUS!!! Thank you for providing a homemade tomato soup recipe that does not need dairy and tastes better than any I have ever had! I used almond milk for a cup of soup but prefer it without any dairy at all. Any ideas on what could be added if I can’t find raw or pasteurized cream, if anything? 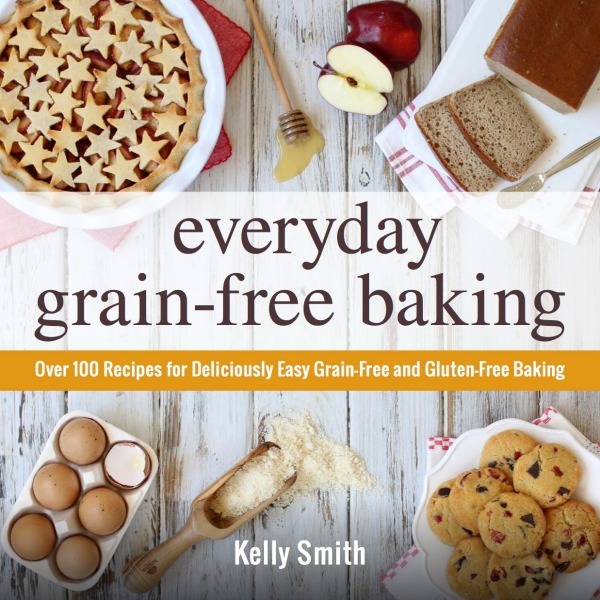 Kelly, I, too, want to thank you for all you share with us! I am thankful! 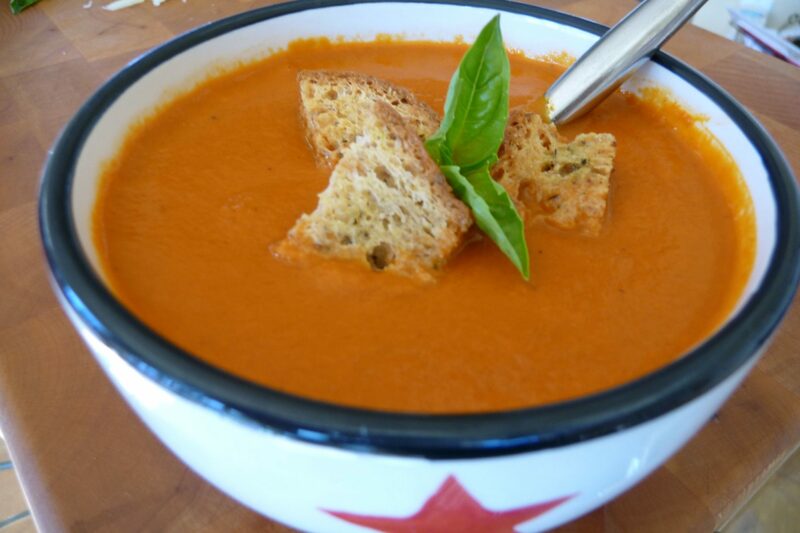 This is the best tomato soup! I made it for the second time tonight because Ive been craving it since the first time I made it a couple weeks ago. Its just delicious. I didn’t even like tomato soup before I had this. Thank you so much for your delicious recipes! 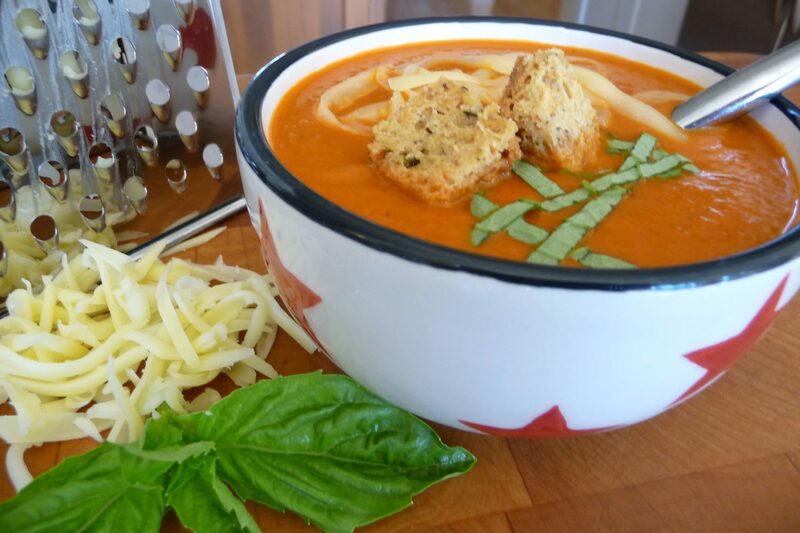 This soup looks amazing… Going to see if I can get to the store so I can make it tonight! Thank you Kelly for your meal plan ideas. I’m just starting to learn how to do this efficiently and thanks a lot for all your good ideas. I found you on The Better Mom.